The year was 1999. The setting: Bellingham, Washington, USA. Hard up against the Canadian border in the Pacific Northwest. As the century drew to a close, an obscure world-music trio, the Sniffing Dervishes was disintegrating. Two of its members, John D’Onofrio and John Rollins discovered that they could happily occupy themselves for many hours at a time by creating strange music using an ever-expanding array of musical instruments from around the world and overdubbing themselves repeatedly. They were easily amused. One thing led to another. In addition to “ethnic” instruments like marimbas, kalimbas and zithers, western instruments were added; including guitars, keyboards, flute, etc. It was an eclectic mix, but needed something else. The final ingredients were supplied by instruments invented and constructed by Rollins, instruments like the tuberimba and tubelodium. The resulting sound was unlike any music that either of the two Johns had ever heard (and trust me, they’ve heard a lot). The Monkey Puzzle Orchestra was born. The recording equipment was primitive to be sure, but the resulting CD, Bathysphere Moon, released in 2000, broke new aural ground, blending a variety of far-flung musical idioms with elements of rock, jazz and yes, French cabaret. Soon afterwards, a track from the CD was included on a sampler CD produced by the Bellingham Independent Music Association (BIMA). One of these found its way to Belgium and for a brief moment in time, the Monkey Puzzle Orchestra became an overnight sensation in Antwerp, receiving significant airplay on progressive radio there. In 2003, a new CD release entitled Visitation featured guest appearances by Jowdy, Doug Banner, Jim Stewart and Ted Rosen. With the additional musicians, the soundscape expanded again and Visitation introduced new frontiers of musical diversity. Work on a new recording began immediately after Visitation’s completion, and the group officially expanded to include Banner, Stewart and Rosen. 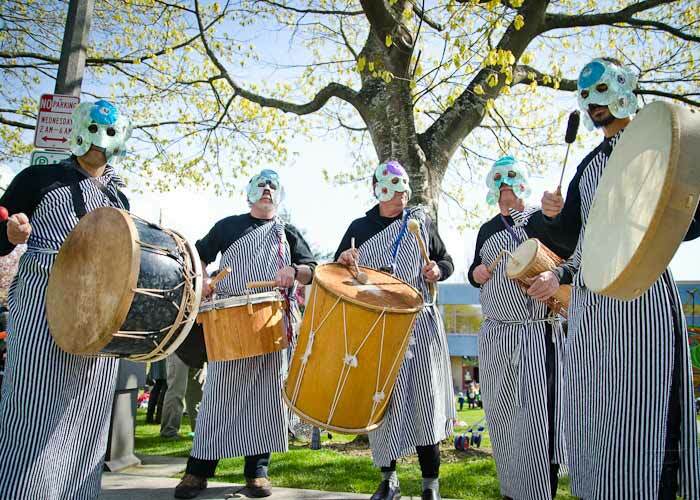 In the summer of ’03 the group was invited to appear at Bellingham’s Downtown Fringe Festival and their performance on October 5th provided a triumphant conclusion to the festival. The Empty Sky, capturing live versions of the Fringe Festival songs was released in 2004. 2005’s Terra Incognita featured the expanded line-up and broke new ground with pieces like Sedna’s Moon, Enya’s Lawyers (a name inspired by a review of the group that – inexplicably – compared the group’s sound to Enya), Big Tiny Little and Hyenas on a Train, featuring Peter Lorre-like vocals by Rosen mixed with the shrieking of mating raccoons. Eclectic, to say the least. By the end of 2005, Rollins had left the group, although he would continue to make guest appearances in the years to come. Rosen also left to pursue solo projects and the Orchestra morphed into a trio of D’Onofrio, Banner and Stewart. 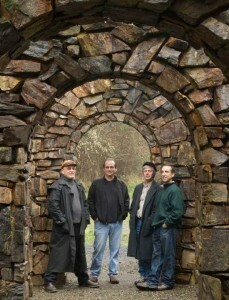 In 2009 Jowdy relocated to the Pacific Northwest and the trio became a quartet. A new CD, Anthropology (2010) had a long gestation period. It was recorded over a three year span from 2005-2008 and features several notable guests joining the core quartet. 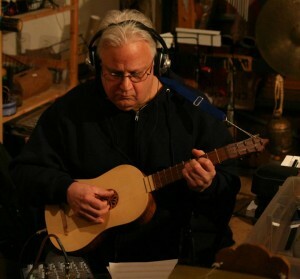 John Rollins appears on several tracks, adding his inimitable electric guitar, jaw harp, flute and more. Vocalist Shannon McGuire provides ethereal vox humana on two tracks, Sitar player Jesse Brytus provides the elements of free-form raga that form the basis for Sarvoyada, and Lance Ekhart joins the Orchestra on Loup Garou, adding a variety of generally nautical percussive sounds. This is a trance music for the modern age; conjuring up the free form spirits of esoteric cultures, uninhibited improvisation and deep subterranean drones from the gaping maw of the collective unconscious. A different kind of Anthropology, to be sure. 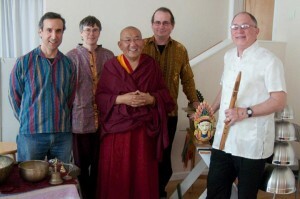 With Llama Arjia Rinpoche, after performing at Red Cedar Dharma Hall, 2011. In 2011, after Stewart decamped, D’Onofrio, Banner and Jowdy met David MacLeod at an MPO performance at the Presence Studio in Bellingham and soon thereafter, he joined the fun. Steve Jones, a veteran of the Afro-Cuban and Jazz scenes came along in 2012, adding a plethora of new instruments and sounds. In 2013, the Monkey Puzzle Orchestra is working on the soundtrack for a video project, editing a new CD, Ephemera, and performing at festivals and shows around the region. 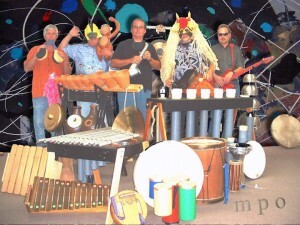 Procession of the Species, 2012 with guest John Blethen on talking drum.